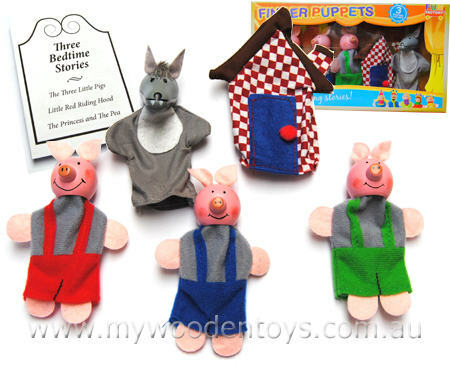 Finger Puppets Three Little Pigs are five sweet finger puppets including three pigs a wolf and a finger puppet house. These puppets have wooden heads and very well made clothes. Each pig has a different coloured overall red, green and blue. The house is made from material and the wolf is a lovely grey and white with nice painted teeth. This set also comes with 3 bedtime stories printed on a simple pamphlet. Material: Wood with Child Safe Paint. Felt, Cotton. We like this because: "Lovely way to tell the story of the Three Little Pigs."